Per chevron argent and vert, a chevron raguly on its upper edge between two mullets and a garb counterchanged. Badge: (Fieldless) A garb argent. Ygraine lives in the Canton of Aschehyrst within the Barony of Carolingia in the East Kingdom. 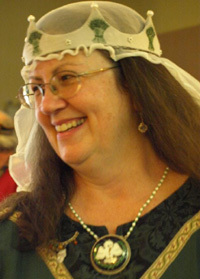 She has been active in the SCA since the early 1980's, and has attended each Pennsic War since XVII. Ygraine is married to Master Li Kung Lo. Ygraine has no set persona, though she has a fondness for 12th century Wales. She dresses to suit the style of a particular event or to survive the weather. Jewelry -- including enameling and metalwork. Music -- she plays the harp and bowed psaltery, and sometimes sings with groups. Scribal Arts - though she is currently not able to do calligraphy and illumination for any length of time, she was formerly a prolific scribe and still teaches these arts. On the editorial staff of the East Kingdom Gazette covering Target Archery and serving as Editor-of-the-Day on a rotating schedule with the rest of the staff. Additionally, Ygraine's Pennsic encampment and friends ("Kellswood") received the Award of the Purple Fretty on 08/08/2007. This is a Midrealm award to recognize excellent service by a group, and was given in thanks for the group's many years of providing refreshments at the Pennsic Archery Champions Team Competitions. This page was last edited on 21 October 2017, at 14:05.